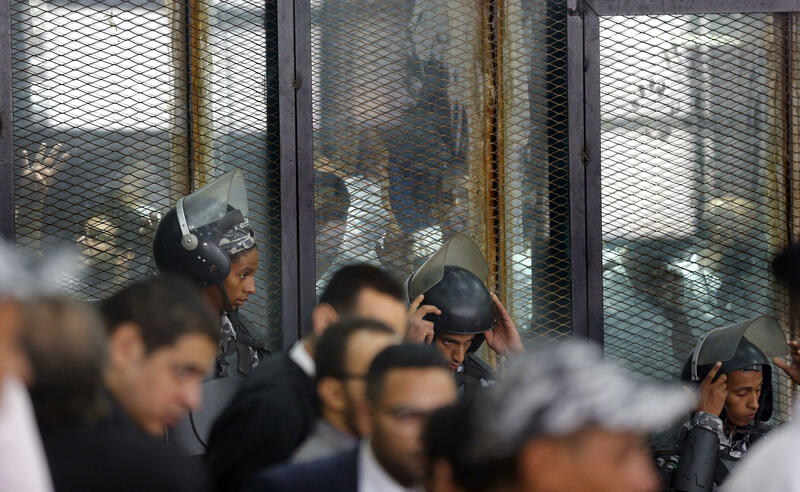 CAIRO -- An Egyptian court sentenced 75 people to death on Saturday, including top figures of the outlawed Muslim Brotherhood group, for their involvement in a 2013 sit-in, state media reported. The Cairo Criminal Court referred the sentences to the Grand Mufti -- the country's top theological authority -- for his non-binding opinion as is the norm in capital cases. Though non-binding, the formality gives a window of opportunity for a judge to reverse an initial sentence. Egyptian authorities have since launched a severe crackdown on Brotherhood members and supporters, arresting many and trying them on terror-related charges. Egyptian courts have held mass trials and handed down death sentences for hundreds of people, drawing international condemnation. Rights groups have repeatedly criticized such mass sentencings and called on authorities to ensure fair trials. They have also denounced the mass trial of the 2013 sit-in. "The idea that more than 700 people could all stand trial together in one day, all facing the death penalty in what is clearly a grossly unfair trial that violates Egypt's own constitution beggar's belief," Najia Bounaim, director of campaign in North Africa at Amnesty International, said last month. "This can only be described as a parody of justice; it casts a dark shadow over the integrity of Egypt's entire system of justice, and makes a mockery of due process," Bounaim said.